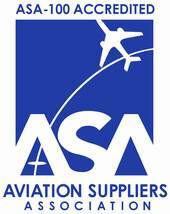 Each year, the Edward J. Glueckler Award is given to an individual in recognition of outstanding commitment, dedication and contribution to the Aviation Suppliers Association and to the aviation industry. It is awarded at the ASA Annual Conference. The award is named for Edward J. Glueckler, the founder and first President of ASA. In honor of Mr. Glueckler's outstanding contributions to the industry, the ASA Board of Directors selects a recipient who exemplifies his vision and enthusiasm. The award was first presented in 1998, the first recipient being Edward J. Glueckler.